Light flashes, and the wind blows. The Great Dragon is in flight! “In spring it rises into the sky, and in August it buries itself in columns of water. 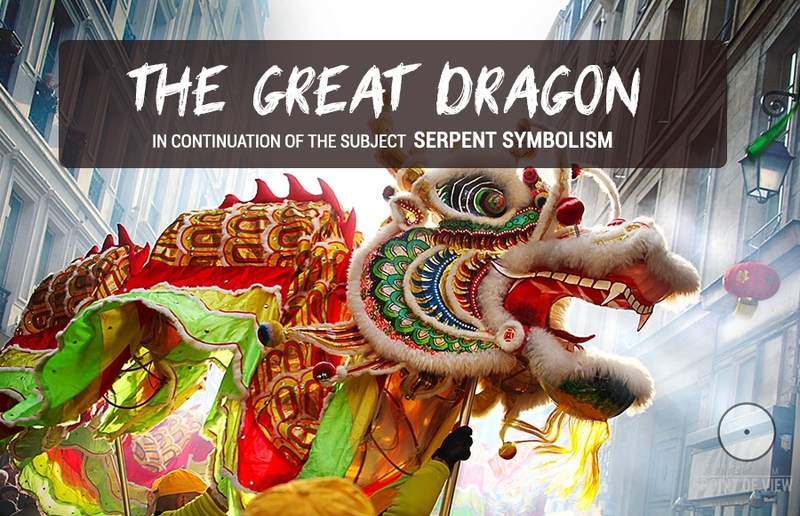 The dragon covers itself with mud on the autumnal equinox and appears in spring, heralding the revival of nature.” It can become visible or invisible according to its desire, and is able to transfigure itself. The eastern dragon is not a terrible monster... but a genius and a symbol of force and kindness. It hides itself in caves of inaccessible mountains or plunges into impregnable depths of the sea, waiting for the time of awakening and action. It uncovers itself in thunderclouds and washes its mane in the darkness of boiling whirls. Its claws are in lightning bends, and its scales start sparkling in the rind of pine trees. Its voice is heard in the hurricane that rolls across the weakened forest and awakes it for a new spring. A dragon is an embodiment of wisdom, peace-loving force and kindness. It occupies a central place in mythology of the peoples of Southeast Asia. 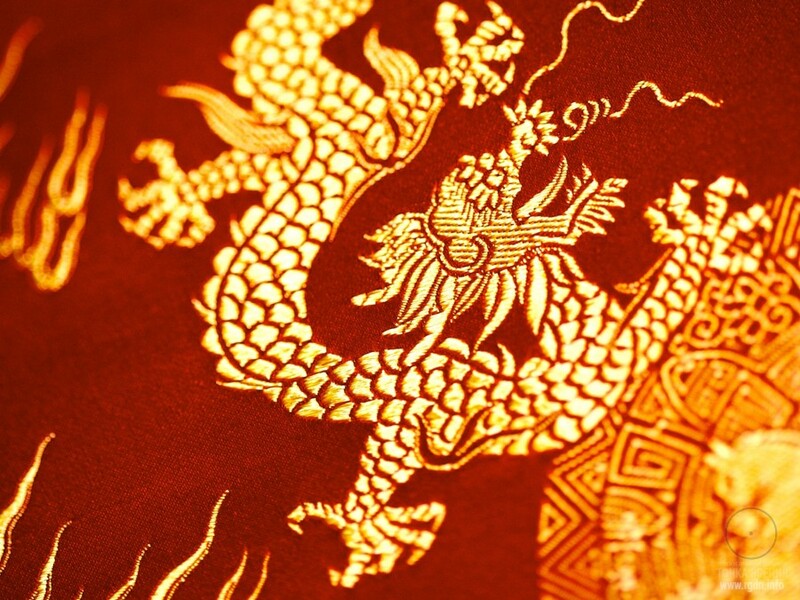 The dragon symbol is developed the most vividly in Chinese mythology. It embodies the Yang male generative principle, and its appearance signifies upcoming events, most often fortunate. 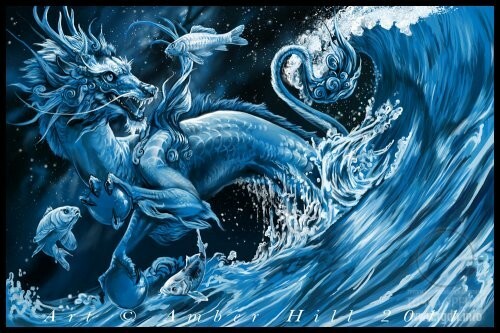 Since ancient times people believed that wandering dragons were everywhere: ascended to the heaven, descended into the sea, possessed power, and were messengers of the Spirit or Deity. Emperors of all dynasties considered themselves to be Sons of Heaven, true descendants of the Dragon. 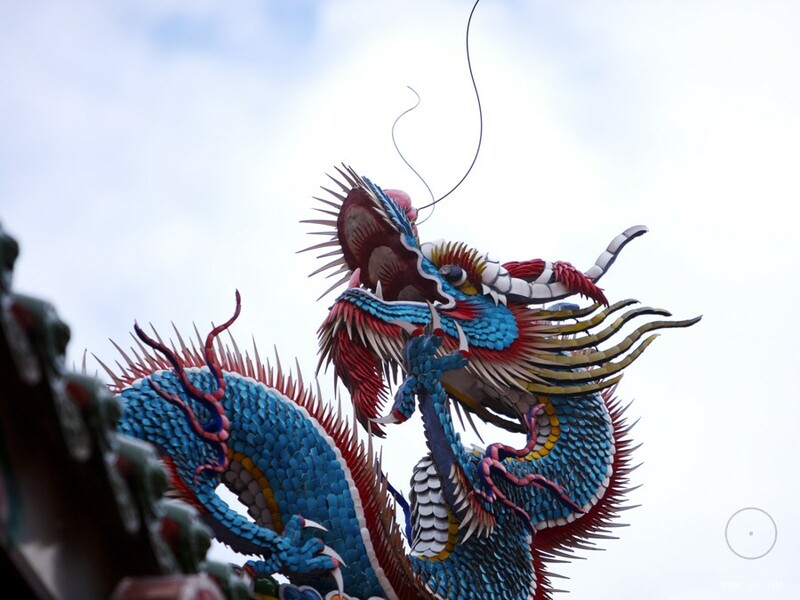 Common people have been worshipping dragons from time immemorial because they are powerful and magical, while their appearance is a sign of wellbeing. In human dreams there are dragons that can implement desires, freely live in the water, proudly walk across the earth, and hover in the clouds. The dragon travels between Heaven and Earth. Two dragons playing with a pearl is a symbol of mutual constructive action of the Yin and Yang forces that give birth to the world, a symbol of all opposite and mutually complementary powers, a symbol of integrity of the universe. 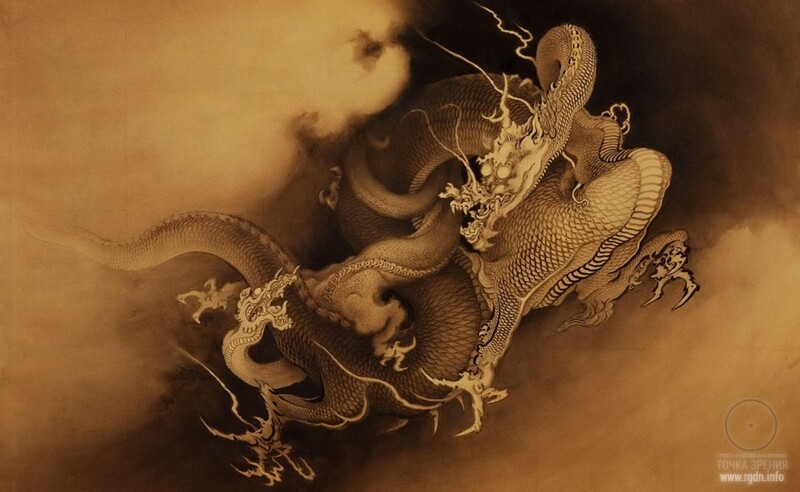 It was exactly a dragon that forwarded a Dao circle drawing to the emperor, on which drawing the interaction between Yin and Yang was reflected. In Daoism and Buddhism it’s a pearl of perfection, wisdom, a spiritual essence of the universe, a sign of the Highest Bound. Legend says, a Chinese monarch who possessed a pearl could turn a night into a day. 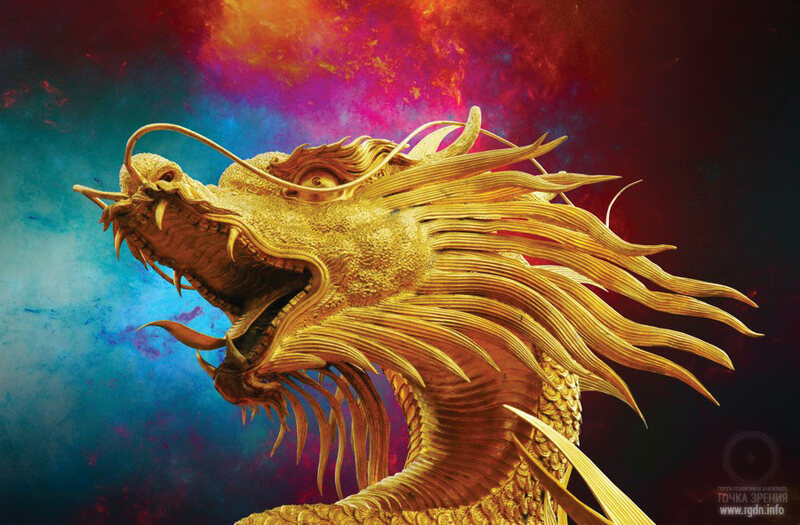 A dragon together with a phoenix (in China) or an eagle (in alchemy) is a symbol of the unity between Heaven and Earth, the divine potentiality, the interaction between macrocosm and microcosm, between the rhythms of evolution and involution, birth and death. Its force is not in its teeth, but in its tail, and it kills with its breath rather than bite. Ancient legends contain descriptions of a dragon as of a marvellous creature, not resembling other creatures and at the same time having similarities with many of them. According to ancient Akkadian sources, a dragon had dog’s legs, a lion’s head and bird’s wings. It is believed that a dragon is a mythical creature, but aren’t there enough evidence of its real existence? 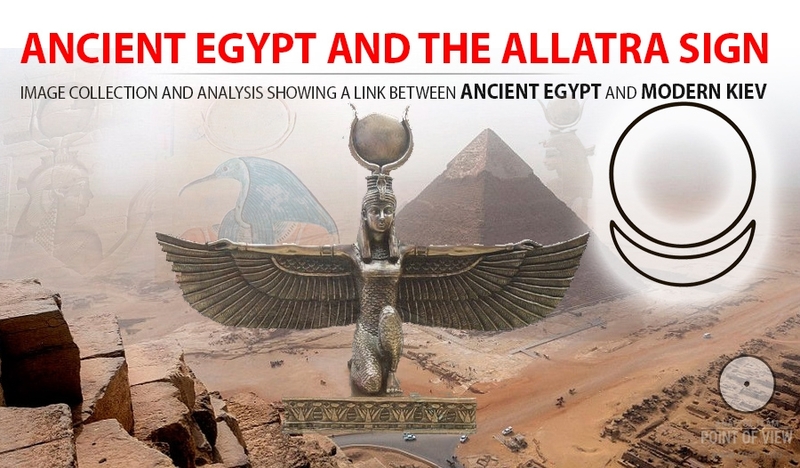 Maybe, myths are what have remained in people’s memory about these extraordinary creatures. The dragon looked to the west into the high sea. Its enormous body crouched and clanked its metal scales, then its giant wings suddenly opened, and the dragon squatted and jumped from the cliff as if picked up by a gust of wind. Its tail, trailed behind the dragon, ploughed a furrow in sandstone. Its blood-red wings dropped, shot up and went down again, and Kalessin was already far away from the island, flying to the west like an arrow. Yet, the song says there are those among humans who know their ancestors were dragons, and some dragons are aware of their kinship with humans. The song says, when the single people split into two races, some individuals preserved the features of both humans and dragons and still had the wings. They rushed not to the east but to the west, into the OpenSea, and flew until they reached the world’s end. There they stayed and lived in peace and harmony, the enormous winged creatures with a human mind and a dragon’s heart. 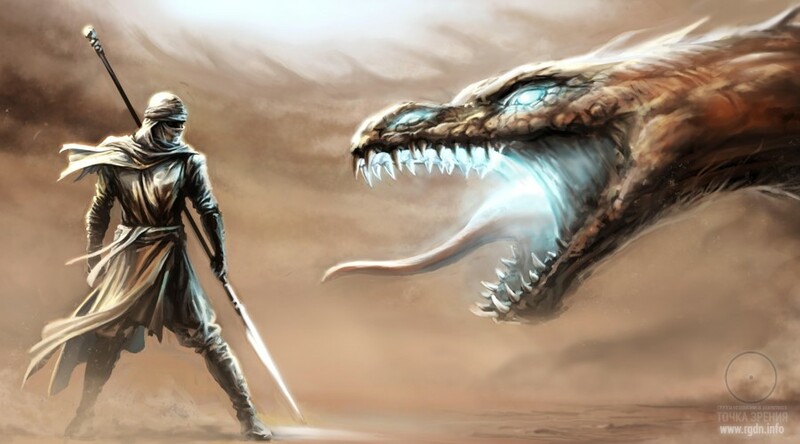 One of the most widespread mythical plots is a fight with a dragon: a hero overcomes a dragon owing to his courage, takes possession of the dragon’s treasures or liberates a captured princess. This plot refers to the duality of a human being, the inner conflict between light and darkness, and the powers of the unconscious that may be used for attaining both constructive and destructive goals. 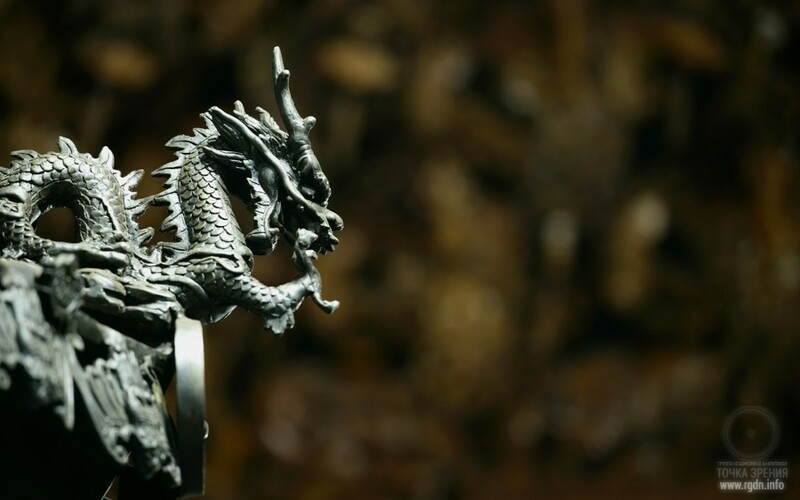 The fight with a dragon symbolises the difficulties to be overcome by a human being in order to gain the treasures of internal knowledge, win a victory over one’s vile dark nature and gain self-control. Only when he implements such a condition, the hero can bring the true light and salvation to the world. Let us also recall Gorynych serpent and Chudo-Yudo monster in Russian folk tales and epics. Still today there is the DragonTower in Yelabuga as well as legends telling that a dragon lived in the tower, who was a wise and knowledgeable foreteller. People visited him to learn about the future, and his predictions always came true. Romans had a dragon on the cohort emblem, from where the word dragoon originates. 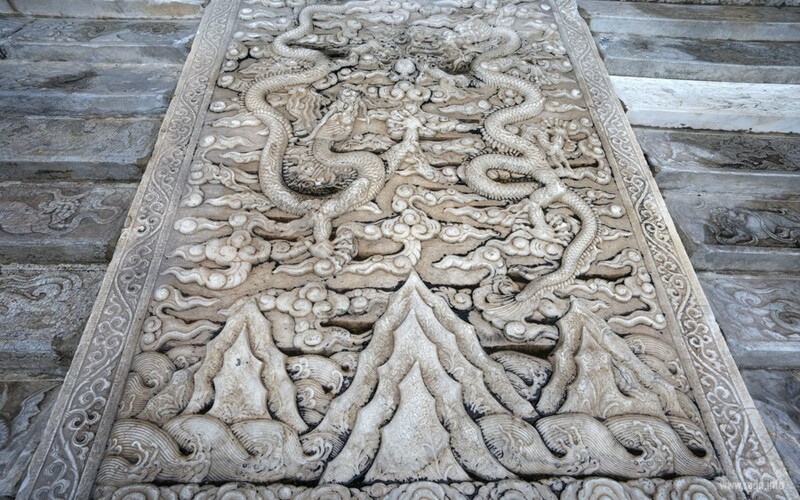 Dragons were depicted on Celtic symbols of the supreme power and the symbols of Chinese emperors. 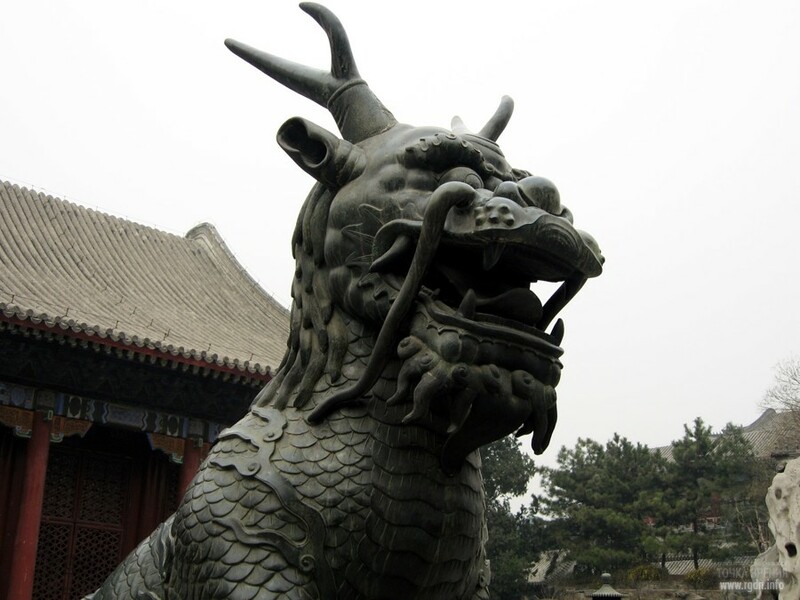 The Chinese emperor’s face used to be called the Dragon Face, and his throne was known as the Dragon Throne. In the 11th book of the Iliad we read that a three-headed blue dragon was depicted on Agamemnon’s shield. 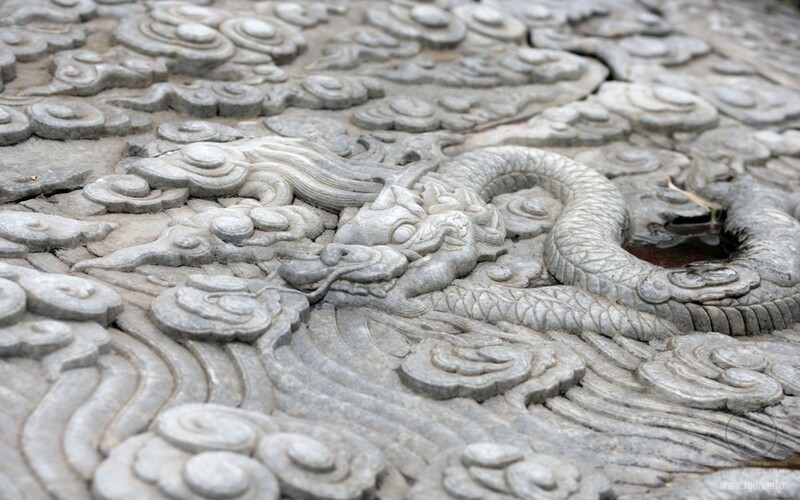 Buddhist and Taoist legends abound in mentions and stories of dragons’ actions. 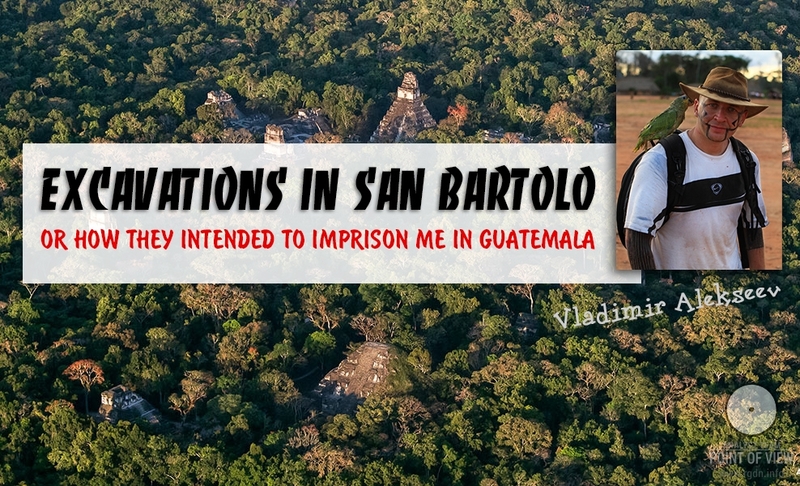 Priests all over the world called themselves the Sons of the Dragon or the Sons of the Serpent God. “I am a serpent, I am a Druid,” Celtic priests uttered. Obviously, the difference between western and eastern dragon images is due to their origin. While the eastern dragon is a creature of Heaven and a friend of Earth, western dragons are amphibious predators with bat’s wings, dangerous, subject to destruction and more associated with pangolins. 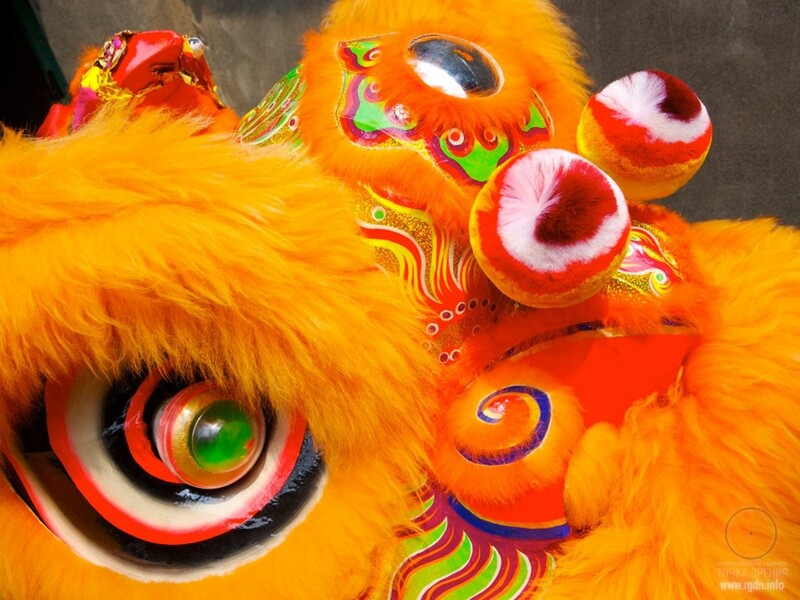 Western dragons are at best frightful and at worst amusing, whereas lung (lóng) in Chinese legends is on the contrary endowed with divine virtues and similar to an angel who is a lion at the same time. Moreover, aphorisms in the oldest Chinese books clearly say the Dragon is a human though divine Being. Echoes them under the water. Behind the brilliance of dragon scales. A dragon would not be a dragon if it was unable to fly. At that, humans would not be humans if, believing in dragons, they did not try to make a flying dragon. From time immemorial people flew dragon / serpent kites in the sky. In Japan they even used to launch kites from city house roofs. Why? Perhaps, not being aware of this ourselves, we cannot imagine our life without a flying dragon, the great patron and protector. 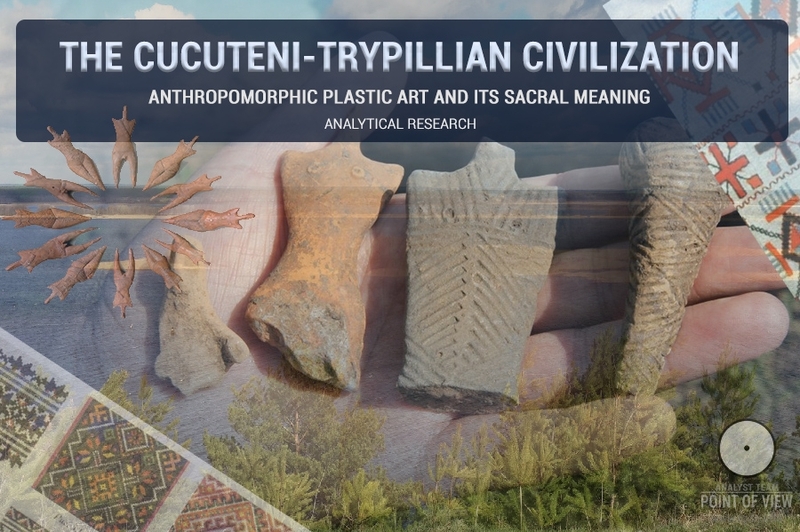 Dragons were symbols of mighty life-giving gods – Quetzalcoatl, the god of the morning star; Atum, the god of eternity; Serapis, the Dragon of Wisdom, as well as of their earthly “children”: Teachers, Sages, Keepers of the World Centre, its treasures and mysteries. This symbol is just as infinite as the ever-evolving world guarded by the ouroboros ring. Ouroboros is an image of a serpent or a dragon swallowing its tail. This symbol is often found in alchemy, oriental religions and ancient cultures. The first ouroboros images are ascribed to the cultures of Ancient India and China. Hindu myths mention Ananta-Shesha serpent that twists itself around a turtle on the back of which there are 4 elephants holding the world on their backs. The famous English alchemist and essayist Sir Thomas Browne (1605-1682), while listing those who died on their birthday, was amazed that the first day of one’s life often coincided with one’s last day, and that “the snake’s tail returns to its mouth right at the same time”. The German chemist Friedrich August Kekulé (1829-1896) asserted he had had a dream about an ouroboros-like ring, which led him to the discovery of the cyclic formula of benzene. Carl Gustav Jung called ouroboros the basic mandala of alchemy, one of the principle archetypes and a symbol of immortality, associating it with dialectics of the conscious and unconscious in the human soul. Sometimes a dragon (serpent) was depicted as the number eight, from where the modern symbol of infinity originated. Nowadays, dragons populate pages of our books as well, e.g. those by Clifford Simak, Roger Zelazny, Eugene Swartz, Richard Bach, John Ronald Tolkien, and other authors. And about the fact that all great battles and victories are a mere outcome of small everyday battles. Five thousand years ago the world’s North Pole was in the Draco constellation. Draco will guard this enigmatic centre again only in 20,000 years, but even today Draco guards the northern sky. And when it opens its mouth it shines. Growing furious in the night. According to an ancient legend, behind the Gate of Cold there stretched out the Land of Eternal Frost and Dark, where the Sacred Dragon lived. In the dragon’s mouth there were candles instead of teeth, and when it opened the mouth everything around lit up with fire. 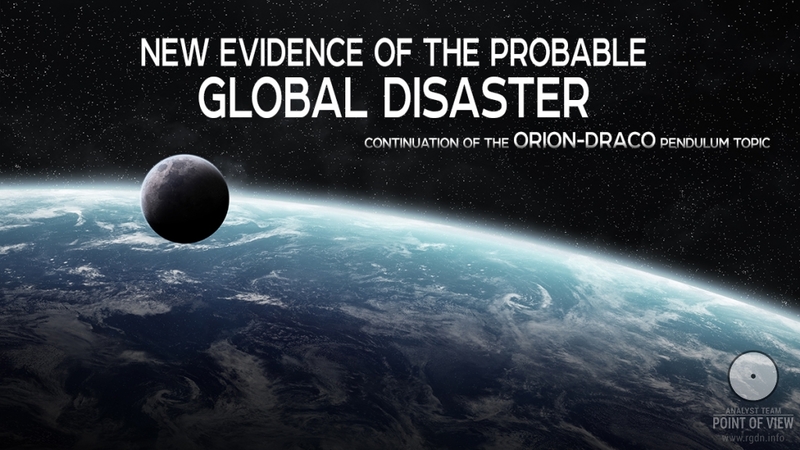 A great significance of the Draco constellation in the creation of the world is based upon the fact that the constellation surrounds the north ecliptic pole*. (*Ecliptic is a visible annual path along which the Sun moves in the celestial sphere). Axis mundi (the world axis) is the most important axis for the Earth. Owing to their attraction the Moon and the Sun tend to turn the planet’s axis, thus the phenomenon of precession arises. The Earth’s axis rotates relative to remote stars, completing one full turn within about 26 thousand years (the so-called Platonic year). At that, the axis circumscribes a circle of 23.5° in radius with a centre at the north ecliptic pole situated in the Draco constellation. 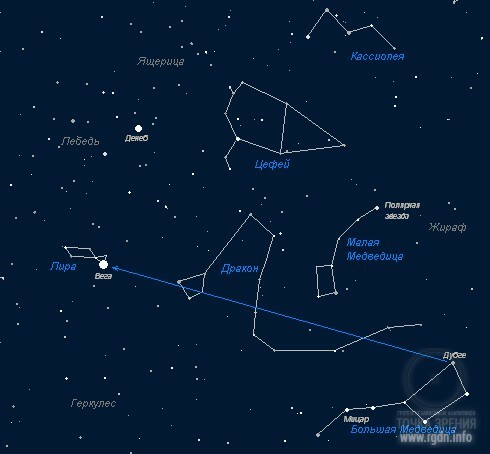 Precession was first discovered in the 2nd century BC by Hipparchus. He found that coordinates of stars had slightly changed compared to those of a century before. 13 thousand years ago the celestial pole pointed to Vega. In the East European Plain Centaurus and the Southern Cross were visible. 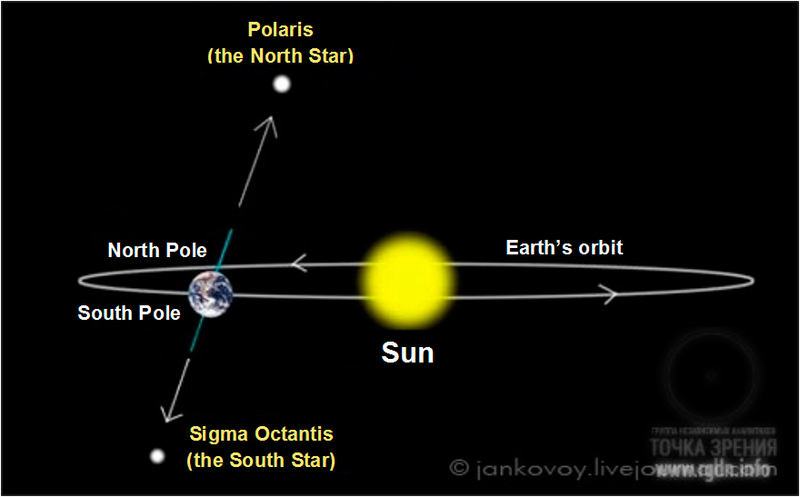 Later on the pole star title was conferred by turns on π, η and τ of Hercules, Thuban and Kochab. Romans had no pole star at all, and called Kochab and Cynosura (α of Ursa Minor / the Little Bear) the Guards. α of Ursa Minor became the pole star circa 1100 AD and will be the closest to the north pole in 2100. Circa 3200 AD stars of the constellation of Cepheus will become pole stars; then they will cede their position to Deneb and Vega. Such rotation represents a great circle of times, within which numerous recurrent changes take place in earthly nature, human society and consciousness (cycles). Between 4000 and 2000 BC the pole star was α of the constellation of Draco. Draco includes more than two hundred stars visible to a naked eye, where brightness of 80 stars exceeds 6. Eltanin is the brightest star in the constellation (magnitude 2.4). 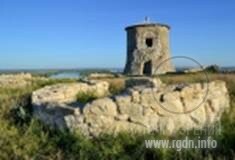 Its name originates from the Arabic al-Tinnin – “the Dragon’s head”. Another interesting star is Kuma (Nu Draconis), a spectroscopic binary star with its components located at a distance of 62 seconds of arc away from each other and clearly visible with binoculars. 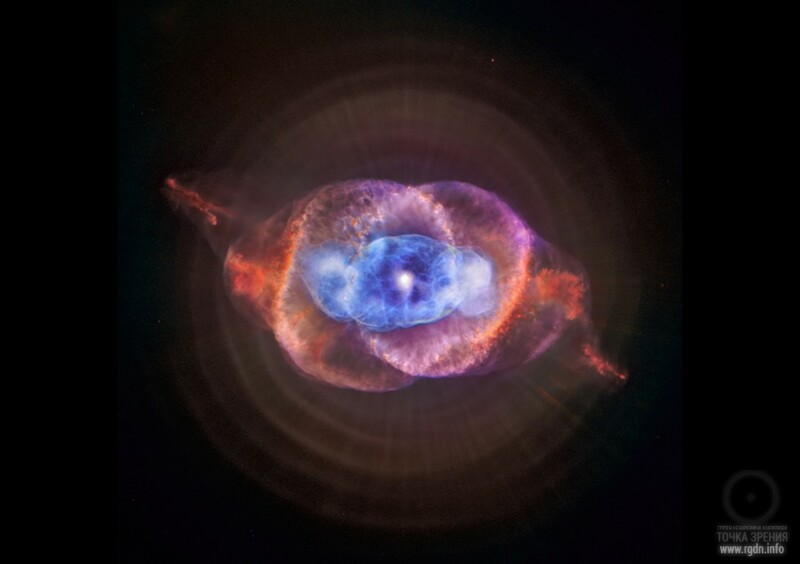 Furthermore, near the ecliptic pole between the Draco stars there is a greenish-blue planetary nebula NGC 6543 – the Cat’s Eye, the name of which is due to its resemblance to an eye of the said animal. 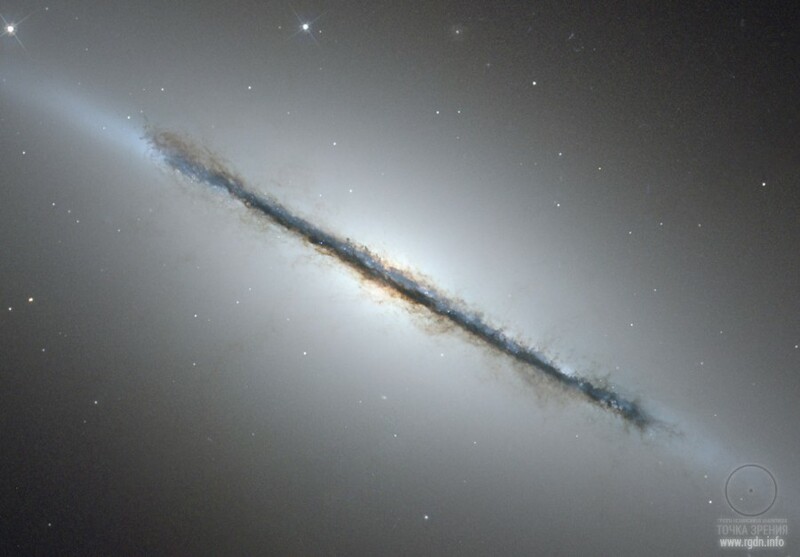 There is also quite an interesting galaxy – the lens-shaped galaxy NGC 5866, or the Spindle Galaxy. It should be mentioned that on present-day photos taken by means of high-performance telescopes the likeness of galaxies to shapes of items they are named after is lost to view. Therefore some names of the galaxies discovered in the 19th – early 20th centuries might provoke bewilderment of uninitiated readers. 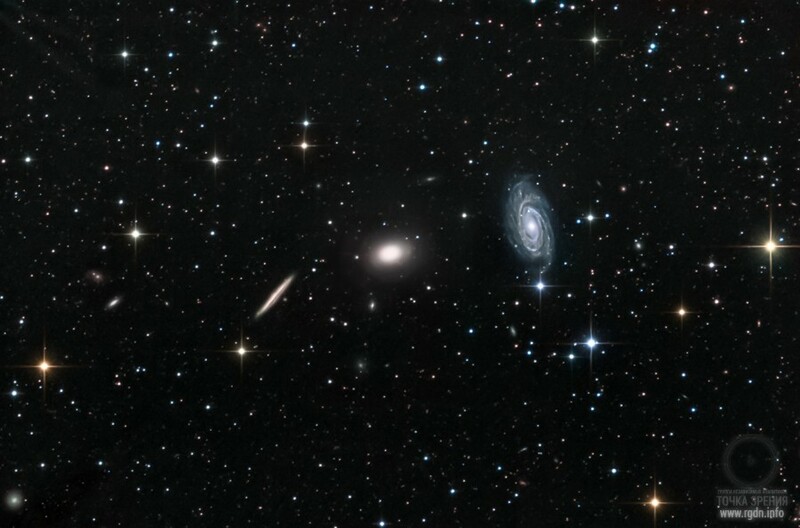 This intriguing trio of galaxies is sometimes referred to as NGC 5985 / the Draco Group and (quite reasonably) is located in the northern constellation of Draco. The above image depicts (from left to right) the face-on spiral galaxy NGC 5985, the elliptical galaxy NGC 5982, and finally the edge-on spiral galaxy NGC 5981. They are all within the single telescopic field of view spanning a little more than half the width of the full moon. While the group is far too small to be a galaxy cluster and has not been catalogued as a compact group, these galaxies all do lie roughly 100 million light-years from planet Earth. On close examination with spectrographs, the bright core of the striking face-on spiral NGC 5985 shows prominent emission in specific wavelengths of light, prompting astronomers to classify it as a Seyfert, a type of active galaxy. Not as well known as other tight groupings of galaxies, the contrast in visual appearance makes this triplet an attractive subject for astrophotographers. This impressively deep exposure hints at faint, sharp-edged shells surrounding the elliptical NGC 5982, evidence of past galactic mergers. It also reveals many even more distant background galaxies. Looking at the star map, we can see that α Draconis (Thuban) is located almost in the middle of the line connecting β Ursa Minor and η Ursa Major. The Draco constellation occupies an area of 1083.0 square degrees in the sky, and 210 stars may be discerned in it with a naked eye. The constellation includes a number of binary stars and dozens of variable stars. 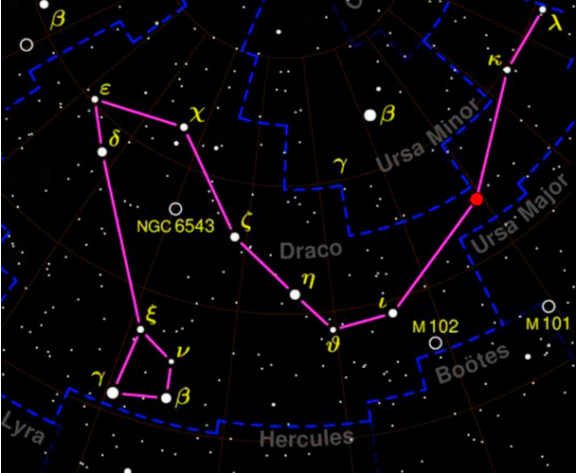 DRACO is a circumpolar constellation, always visible above the horizon. Yet, the best time to observe it is at night between late May and early November. The celestial sphere area occupied by Draco stretches between the Great and Little Bears, therefore it is said that “the dragon flies between the two bears”. On a clear, moonless night a naked eye can discern about 80 stars in the Draco constellation, but all of them are rather faint. The brightest stars have a magnitude of 3-4, and only the brightest one in the entire constellation has magnitude 2. Should we connect the brightest stars in Draco with lines, a typical geometric shape of the constellation will come into sight, i.e. a long twisting broken line ending with a trapezium of four stars (the dragon’s head). The brightest star is exactly one of these four. This twisting line reminded ancient Greeks of an enormous body of a monstrous dragon with spread wings and a terrible head with sword-sharp teeth jutting out of its mouth.